Perhaps the holiday season is approaching and you’d like your MySpace page to reflect it. Or maybe you’ve decided to share your love of Christmas with friends and family all year long. One of the great things about MySpace is that it is easy to both create and edit a page so that you can change it whenever you’d like. There are a lot of websites that support MySpace and provide free Christmas MySpace layouts so that you can demonstrate your Christmas spirit whenever you choose. 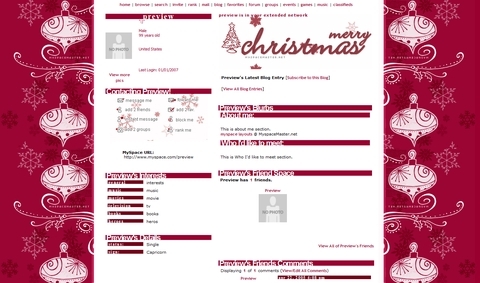 Christmas MySpace layouts come in many colors and styles. You can find themes with elegant, foil-wrapped packages and gilded ornaments and you can find whimsical layouts with dancing Santas and reindeer. There are red layouts, green layouts, golden layouts and every color in between. There are layouts featuring snowmen, Christmas trees, manger scenes, snowflakes and any Christmas image that you can imagine. Browsing through the Christmas layouts is a lot of fun and you are sure to find a layout that you’d like to see on your MySpace page. The most difficult part may be narrowing your choices down to only one! After you browse through the sites that offer Christmas MySpace layouts and choose one you will need to add the layout code to your MySpace account profile in order for it to display on your page. This is easier than it may sound because all you have to do is copy and paste. You will see a text box by the layout you’ve chosen that contains the code. The first step is to copy the code. Then you must log into your MySpace account, go into your profile, click on “Edit Profile” and paste the code into the “About Me” section. If you are changing an existing layout you first must be sure to delete the code for the original layout or your new Christmas layout won’t be displayed. Be sure to save the old code if you plan to restore your site to the original design after the Christmas season has passed. Another way to celebrate Christmas is by adding music to your MySpace page. There are several ways to do this. One is to click on the “Music” tab above your profile and browse through songs in the MySpace network, or you can conduct a search to find a specific song. Using one of the many Christmas MySpace layouts together with a traditional Christmas carol will show the visitors to your page how much you love the holiday season.